This article is about a Hindu philosopher. For Youtube personality and film producer, see Adi Shankar. "Adi Shankaracharya" redirects here. For the 1983 Indian film, see Adi Shankaracharya (film). Adi Shankara (Sanskrit: आदि शङ्कर [aːdɪ ɕɐŋkɐɽɐ]) was an early 8th century Indian philosopher and theologian who consolidated the doctrine of Advaita Vedanta. [note 1] He is credited with unifying and establishing the main currents of thought in Hinduism. His works in Sanskrit discuss the unity of the ātman and Nirguna Brahman "brahman without attributes". He wrote copious commentaries on the Vedic canon (Brahma Sutras, Principal Upanishads and Bhagavad Gita) in support of his thesis. His works elaborate on ideas found in the Upanishads. Shankara's publications criticised the ritually-oriented Mīmāṃsā school of Hinduism. He also explained the key difference between Hinduism and Buddhism, stating that Hinduism asserts "Atman (Soul, Self) exists", while Buddhism asserts that there is "no Soul, no Self". Shankara travelled across the Indian subcontinent to propagate his philosophy through discourses and debates with other thinkers. He established the importance of monastic life as sanctioned in the Upanishads and Brahma Sutra, in a time when the Mīmāṃsā school established strict ritualism and ridiculed monasticism. He is reputed to have founded four mathas ("monasteries"), which helped in the historical development, revival and spread of Advaita Vedanta of which he is known as the greatest revivalist. Adi Shankara is believed to be the organiser of the Dashanami monastic order and unified the Shanmata tradition of worship. He is also known as Adi Shankaracharya, Shankara Bhagavatpada, sometimes spelled as Sankaracharya, (Ādi) Śaṅkarācārya, Śaṅkara Bhagavatpāda and Śaṅkara Bhagavatpādācārya. There are at least fourteen different known biographies of Adi Shankara's life. Many of these are called the Śankara Vijaya, while some are called Guruvijaya, Sankarabhyudaya and Shankaracaryacarita. Of these, the Brhat-Sankara-Vijaya by Citsukha is the oldest hagiography but only available in excerpts, while Sankaradigvijaya by Vidyaranya and Sankaravijaya by Anandagiri are the most cited. Other significant biographies are the Mādhavīya Śaṅkara Vijayaṃ (of Mādhava, c. 14th century), the Cidvilāsīya Śaṅkara Vijayaṃ (of Cidvilāsa, c. between the 15th and 17th centuries), and the Keraļīya Śaṅkara Vijayaṃ (of the Kerala region, extant from c. the 17th century). These, as well as other biographical works on Shankara, were written many centuries to a thousand years after Shankara's death, in Sanskrit and non-Sanskrit languages, and the biographies are filled with legends and fiction, often mutually contradictory. Scholars note that one of the most cited Shankara hagiography by Anandagiri includes stories and legends about historically different people, but all bearing the same name of Sri Shankaracarya or also referred to as Shankara but likely meaning more ancient scholars with names such as Vidya-sankara, Sankara-misra and Sankara-nanda. Some biographies are probably forgeries by those who sought to create a historical basis for their rituals or theories. Adi Shankara died in the thirty third year of his life, and reliable information on his actual life is scanty. 509–477 BCE: This dating, is based on records of the heads of the Shankara's cardinal institutions Maṭhas at Dvaraka Pitha, the Govardhana matha and Badri and the Kanchi Peetham. According to their records, these monasteries were founded in Kali 2593 (509 BCE) by a person named Adi Shankara. The successive heads of the Kanchi and all other major Hindu Advaita tradition monasteries have been called Shankaracharya leading to some confusion, discrepancies and scholarly disputes. The chronology stated in Kanchi matha texts recognizes five major Shankaras: Adi, Kripa, Ujjvala, Muka and Abhinava. According to the Kanchi matha tradition, it is "Abhinava Shankara" that western scholarship recognizes as the Advaita scholar Adi Shankara, while the monastery continues to recognize its 509 BCE chronology. 44–12 BCE: the commentator Anandagiri believed he was born at Chidambaram in 44 BCE and died in 12 BCE. 6th century CE: Telang placed him in this century. Sir R.G. Bhandarkar believed he was born in 680 CE. c. 700 – c. 750 CE: Late 20th-century and early 21st-century scholarship tends to place Adi Shankara's life of 32 years in the first half of the 8th century. According to the Indologist and Asian Religions scholar John Koller, there is considerable controversy regarding the dates of Shankara – widely regarded as one of India's greatest thinkers, and "the best recent scholarship argues that he was born in 700 and died in 750 CE". 788–820 CE: This was proposed by early 20th scholars and was customarily accepted by scholars such as Max Müller, Macdonnel, Pathok, Deussen and Radhakrishna, and others. The date 788–820 is also among those considered acceptable by Swami Tapasyananda, though he raises a number of questions. Though the 788–820 CE dates are widespread in 20th-century publications, recent scholarship has questioned the 788–820 CE dates. 805–897 CE: Venkiteswara not only places Shankara later than most, but also had the opinion that it would not have been possible for him to have achieved all the works apportioned to him, and has him live ninety two years. The popularly accepted dating places Adi Shankara to be a scholar from the first half of the 8th century CE. Shankara's hagiography describe him as someone who was attracted to the life of Sannyasa (hermit) from early childhood. His mother disapproved. A story, found in all hagiographies, describe Shankara at age eight going to a river with his mother, Sivataraka, to bathe, and where he is caught by a crocodile. Shankara called out to his mother to give him permission to become a Sannyasin or else the crocodile will kill him. The mother agrees, Shankara is freed and leaves his home for education. He reaches a Saivite sanctuary along a river in a north-central state of India, and becomes the disciple of a teacher named Govinda Bhagavatpada. The stories in various hagiographies diverge in details about the first meeting between Shankara and his Guru, where they met, as well as what happened later. Several texts suggest Shankara schooling with Govindapada happened along the river Narmada in Omkareshwar, a few place it along river Ganges in Kashi (Varanasi) as well as Badari (Badrinath in the Himalayas). The biographies vary in their description of where he went, who he met and debated and many other details of his life. Most mention Shankara studying the Vedas, Upanishads and Brahmasutra with Govindapada, and Shankara authoring several key works in his youth, while he was studying with his teacher. It is with his teacher Govinda, that Shankara studied Gaudapadiya Karika, as Govinda was himself taught by Gaudapada. Most also mention a meeting with scholars of the Mimamsa school of Hinduism namely Kumarila and Prabhakara, as well as Mandana and various Buddhists, in Shastrarth (an Indian tradition of public philosophical debates attended by large number of people, sometimes with royalty). Thereafter, the biographies about Shankara vary significantly. Different and widely inconsistent accounts of his life include diverse journeys, pilgrimages, public debates, installation of yantras and lingas, as well as the founding of monastic centers in north, east, west and south India. While the details and chronology vary, most biographies mention Adi Shankara traveling widely within India, Gujarat to Bengal, and participating in public philosophical debates with different orthodox schools of Hindu philosophy, as well as heterodox traditions such as Buddhists, Jains, Arhatas, Saugatas, and Carvakas. During his tours, he is credited with starting several Matha (monasteries), however this is uncertain. Ten monastic orders in different parts of India are generally attributed to Shankara's travel-inspired Sannyasin schools, each with Advaita notions, of which four have continued in his tradition: Bharati (Sringeri), Sarasvati (Kanchi), Tirtha and Asramin (Dvaraka). Other monasteries that record Shankara's visit include Giri, Puri, Vana, Aranya, Parvata and Sagara – all names traceable to Ashrama system in Hinduism and Vedic literature. Adi Shankara had a number of disciple scholars during his travels, including Padmapada (also called Sanandana, associated with the text Atma-bodha), Sureshvara, Tothaka, Citsukha, Prthividhara, Cidvilasayati, Bodhendra, Brahmendra, Sadananda and others, who authored their own literature on Shankara and Advaita Vedanta. Adi Sankara is believed to have died aged 32, at Kedarnath in the northern Indian state of Uttarakhand, a Hindu pilgrimage site in the Himalayas. Texts say that he was last seen by his disciples behind the Kedarnath temple, walking on the Himalayas until he was not traced. Some texts locate his death in alternate locations such as Kanchipuram (Tamil Nadu) and somewhere in the state of Kerala. Adi Shankara's works are the foundation of Advaita Vedanta school of Hinduism, and his doctrine, states Sengaku Mayeda, "has been the source from which the main currents of modern Indian thought are derived". Over 300 texts are attributed to his name, including commentaries (Bhāṣya), original philosophical expositions (Prakaraṇa grantha) and poetry (Stotra). However most of these are not authentic works of Adi Shankara and are likely to be works of his admirers or scholars whose name was also Shankaracharya. Piantelli has published a complete list of works attributed to Adi Sankara, along with issues of authenticity for most. Adi Shankara is most known for his systematic reviews and commentaries (Bhasyas) on ancient Indian texts. Shankara's masterpiece of commentary is the Brahmasutrabhasya (literally, commentary on Brahma Sutra), a fundamental text of the Vedanta school of Hinduism. His commentaries on ten Mukhya (principal) Upanishads are also considered authentic by scholars, and these are: Bhasya on the Brihadaranyaka Upanishad, the Chandogya Upanishad, the Aitareya Upanishad, the Taittiriya Upanishad, the Kena Upanishad, the Isha Upanishad, the Katha Upanishad, the Mundaka Upanishad, the Prashna Upanishad, and the Mandukya Upanishad. Of these, the commentary on Mandukya, is actually a commentary on Madukya-Karikas by Gaudapada. Other authentic works of Shankara include commentaries on the Bhagavad Gita (part of his Prasthana Trayi Bhasya). His Vivarana (tertiary notes) on the commentary by Vedavyasa on Yogasutras as well as those on Apastamba Dharma-sũtras (Adhyatama-patala-bhasya) are accepted by scholars as authentic works of Adi Shankara. Among the Stotra (poetic works), the Daksinamurti Stotra, the Bhajagovinda Stotra, the Sivanandalahari, the Carpata-panjarika, the Visnu-satpadi, the Harimide, the Dasa-shloki, and the Krishna-staka are likely to be authentic. Shankara also authored Upadesasahasri, his most important original philosophical work. Of other original Prakaranas (प्रकरण, monographs, treatise), seventy six works are attributed to Adi Shankara. Modern era Indian scholars such as Belvalkar as well as Upadhyaya accept five and thirty nine works respectively as authentic. Shankara's stotras considered authentic include those dedicated to Krishna (Vaishnavism) and one to Shiva (Shaivism) – often considered two different sects within Hinduism. Scholars suggest that these stotra are not sectarian, but essentially Advaitic and reach for a unified universal view of Vedanta. Adi Shankara's commentary on the Brahma Sutras is the oldest surviving. However, in that commentary, he mentions older commentaries like those of Dravida, Bhartrprapancha and others which are either lost or yet to be found. Commentaries on Nrisimha-Purvatatapaniya and Shveshvatara Upanishads are attributed to Adi Shankara, but their authenticity is highly doubtful. Similarly, commentaries on several early and later Upanishads attributed to Shankara are rejected by scholars to be his works, and are likely works of later scholars; these include: Kaushitaki Upanishad, Maitri Upanishad, Kaivalya Upanishad, Paramahamsa Upanishad, Sakatayana Upanishad, Mandala Brahmana Upanishad, Maha Narayana Upanishad, Gopalatapaniya Upanishad. However, in Brahmasutra-Bhasya, Shankara cites some of these Upanishads as he develops his arguments, but the historical notes left by his companions and disciples, along with major differences in style and the content of the commentaries on later Upanishad have led scholars to conclude that the commentaries on later Upanishads were not Shankara's work. The authenticity of Shankara being the author of Vivekacūḍāmaṇi has been questioned, though it is "so closely interwoven into the spiritual heritage of Shankara that any analysis of his perspective which fails to consider [this work] would be incomplete. "[note 2] According to Grimes, "modern scholars tend to reject its authenticity as a work by Shankara," while "traditionalists tend to accept it." Nevertheless, does Grimes argue that "there is still a likelihood that Śaṅkara is the author of the Vivekacūḍāmaṇi,"  noting that "it differs in certain respects from his other works in that it addresses itself to a different audience and has a different emphasis and purpose." Aparoksha Anubuti and Atmabodha are also attributed to Shankara, as his original philosophical treatises, but this is doubtful. Paul Hacker has also expressed some reservations that the compendium Sarva-darsana-siddhanta Sangraha was completely authored by Shankara, because of difference in style and thematic inconsistencies in parts. Similarly, Gayatri-bhasya is doubtful to be Shankara's work. Other commentaries that are highly unlikely to be Shankara's work include those on Uttaragita, Siva-gita, Brahma-gita, Lalita-shasranama, Suta-samhita and Sandhya-bhasya. The commentary on the Tantric work Lalita-trisati-bhasya attributed to Adi Shankara is also unauthentic. Adi Shankara is also widely credited with commentaries on other scriptural works, such as the Vishnu sahasranāma and the Sānatsujātiya, but both these are considered apocryphal by scholars who have expressed doubts. Hastamalakiya-bhasya is also widely believed in India to be Shankara's work and it is included in Samata-edition of Shankara's works, but some scholars consider it to be the work of Shankara's student. According to these [widely represented contemporary] studies, Shankara only accorded a provisional validity to the knowledge gained by inquiry into the words of the Śruti (Vedas) and did not see the latter as the unique source (pramana) of Brahmajnana. The affirmations of the Śruti, it is argued, need to be verified and confirmed by the knowledge gained through direct experience (anubhava) and the authority of the Śruti, therefore, is only secondary. Sengaku Mayeda concurs, adding Shankara maintained the need for objectivity in the process of gaining knowledge (vastutantra), and considered subjective opinions (purushatantra) and injunctions in Śruti (codanatantra) as secondary. Mayeda cites Shankara's explicit statements emphasizing epistemology (pramana-janya) in section 1.18.133 of Upadesasahasri and section 1.1.4 of Brahmasutra-bhasya. According to Michael Comans (aka Vasudevacharya), Adi Shankara considered perception and inference as a primary most reliable epistemic means, and where these means to knowledge help one gain "what is beneficial and to avoid what is harmful", there is no need for or wisdom in referring to the scriptures. In certain matters related to metaphysics and ethics, says Shankara, the testimony and wisdom in scriptures such as the Vedas and the Upanishads become important. Adi Shankara cautioned against cherrypicking a phrase or verse out of context from Vedic literature, and remarks in the opening chapter of his Brahmasutra-Bhasya that the Anvaya (theme or purport) of any treatise can only be correctly understood if one attends to the Samanvayat Tatparya Linga, that is six characteristics of the text under consideration: (1) the common in Upakrama (introductory statement) and Upasamhara (conclusions); (2) Abhyasa (message repeated); (3) Apurvata (unique proposition or novelty); (4) Phala (fruit or result derived); (5) Arthavada (explained meaning, praised point) and (6) Yukti (verifiable reasoning). While this methodology has roots in the theoretical works of Nyaya school of Hinduism, Shankara consolidated and applied it with his unique exegetical method called Anvaya-Vyatireka, which states that for proper understanding one must "accept only meanings that are compatible with all characteristics" and "exclude meanings that are incompatible with any". Hacker and Phillips note that this insight into rules of reasoning and hierarchical emphasis on epistemic steps is "doubtlessly the suggestion" of Shankara in Brahma-sutra, an insight that flowers in the works of his companion and disciple Padmapada. Merrell-Wolff states that Shankara accepts Vedas and Upanishads as a source of knowledge as he develops his philosophical theses, yet he never rests his case on the ancient texts, rather proves each thesis, point by point using pramanas (epistemology), reason and experience. Adi Shankara, in his text Upadesasahasri, discourages ritual worship such as oblations to Deva (God), because that assumes the Self within is different from the Brahman. The "doctrine of difference" is wrong, asserts Shankara, because, "he who knows the Brahman is one and he is another, does not know Brahman". However, Shankara also asserts that Self-knowledge is realized when one's mind is purified by an ethical life that observes Yamas such as Ahimsa (non-injury, non-violence to others in body, mind and thoughts) and Niyamas. Rituals and rites such as yajna (a fire ritual), asserts Shankara, can help draw and prepare the mind for the journey to Self-knowledge. He emphasizes the need for ethics such as Akrodha and Yamas during Brahmacharya, stating the lack of ethics as causes that prevent students from attaining knowledge. Adi Shankara has been varyingly called as influenced by Shaivism and Shaktism. However, his works and philosophy suggest greater overlap with Vaishnavism, influence of Yoga school of Hinduism, but most distinctly his Advaitin convictions with a monistic view of spirituality. Adi Shankara systematised the works of preceding philosophers. His system marks a turn from realism to idealism. His Advaita ("non-dualism") interpretation of the sruti postulates the identity of the Self (Atman) and the Whole (Brahman[note 4]). According to Adi Shankara, the one unchanging entity (Brahman) alone is real, while changing entities do not have absolute existence. The key source texts for this interpretation, as for all schools of Vedānta, are the Prasthanatrayi–the canonical texts consisting of the Upanishads, the Bhagavad Gita and the Brahma Sutras. Advaita Vedanta is based on śāstra ("scriptures"), yukti ("reason") and anubhava ("experiential knowledge"), and aided by karmas ("spiritual practices"). Starting from childhood, when learning has to start, the philosophy has to be a way of life. Shankara's primary objective was to understand and explain how moksha is achievable in this life, what it is means to be liberated, free and a Jivanmukta. His philosophical thesis was that jivanmukti is self-realization, the awareness of Oneness of Self and the Universal Spirit called Brahman. the type of yoga which Sankara presents here is a method of merging, as it were, the particular (visesa) into the general (samanya). For example, diverse sounds are merged in the sense of hearing, which has greater generality insofar as the sense of hearing is the locus of all sounds. The sense of hearing is merged into the mind, whose nature consists of thinking about things, and the mind is in turn merged into the intellect, which Sankara then says is made into 'mere cognition' (vijnanamatra); that is, all particular cognitions resolve into their universal, which is cognition as such, thought without any particular object. And that in turn is merged into its universal, mere Consciousness (prajnafnaghana), upon which everything previously referred to ultimately depends. Shankara rejected those yoga system variations that suggest complete thought suppression leads to liberation, as well the view that the Shrutis teach liberation as something apart from the knowledge of the oneness of the Self. Knowledge alone and insights relating to true nature of things, taught Shankara, is what liberates. He placed great emphasis on the study of the Upanisads, emphasizing them as necessary and sufficient means to gain Self-liberating knowledge. Sankara also emphasized the need for and the role of Guru (Acharya, teacher) for such knowledge. Shankara's Vedanta shows similarities with Mahayana Buddhism; opponents have even accused Shankara of being a "crypto-Buddhist," a qualification which is rejected by the Advaita Vedanta tradition, given the differences between these two schools. According to Shankara, a major difference between Advaita and Mahayana Buddhism are their views on Atman and Brahman. According to both Loy and Jayatilleke, more differences can be discerned. ... this is the investigation whether after the death of man the soul exists; some assert the soul exists; the soul does not exist, assert others." At the end, states Shankara, the same Upanishad concludes with the words, "it exists." There are also differences in the understanding of what "liberation" means. Nirvana, a term more often used in Buddhism, is the liberating realization and acceptance that there is no Self (anatman). Moksha, a term more common in Hinduism, is liberating realization and acceptance of Self and Universal Soul, the consciousness of one's Oneness with all existence and understanding the whole universe as the Self. Stcherbatsky in 1927 criticized Shankara for demanding the use of logic from Madhyamika Buddhists, while himself resorting to revelation as a source of knowledge. [note 6] Sircar in 1933 offered a different perspective and stated, "Sankara recognizes the value of the law of contrariety and self-alienation from the standpoint of idealistic logic; and it has consequently been possible for him to integrate appearance with reality." Recent scholarship states that Shankara's arguments on revelation are about apta vacana (Sanskrit: आप्तवचन, sayings of the wise, relying on word, testimony of past or present reliable experts). It is part of his and Advaita Vedanta's epistemological foundation. Advaita Vedanta school considers such testimony epistemically valid asserting that a human being needs to know numerous facts, and with the limited time and energy available, he can learn only a fraction of those facts and truths directly. Shankara considered the teachings in the Vedas and Upanishads as apta vacana and a valid source of knowledge. He suggests the importance of teacher-disciple relationship on combining logic and revelation to attain moksha in his text Upadeshasahasri. Anantanand Rambachan and others state Shankara methodology did not rely exclusively on Vedic statements, but included a range of logical methods, reasoning methodology and pramanas. Shankara and his followers borrowed much of their dialectic form of criticism from the Buddhists. His Brahman was very much like the sunya of Nagarjuna [...] The debts of Shankara to the self-luminosity of the Vijnanavada Buddhism can hardly be overestimated. There seems to be much truth in the accusations against Shankara by Vijnana Bhiksu and others that he was a hidden Buddhist himself. I am led to think that Shankara's philosophy is largely a compound of Vijnanavada and Sunyavada Buddhism with the Upanisad notion of the permanence of self superadded. ... the difference between Sunyavada (Mahayana) philosophy of Buddhism and Advaita philosophy of Hinduism may be a matter of emphasis, not of kind. Shankara lived in the time of the so-called "Late classical Hinduism", which lasted from 650 till 1100 CE. This era was one of political instability that followed Gupta dynasty and King Harsha of the 7th century CE. It was a time of social and cultural change as the ideas of Buddhism, Jainism and various traditions within Hinduism were competing for members. Buddhism in particular had emerged as a powerful influence in India's spiritual traditions in the first 700 years of the 1st millennium CE. 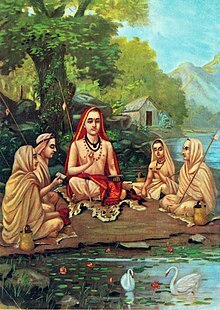 Shankara, and his contemporaries, made a significant contribution in understanding Buddhism and the ancient Vedic traditions, then transforming the extant ideas, particularly reforming the Vedanta tradition of Hinduism, making it India's most important tradition for more than a thousand years. Shankara has an unparallelled status in the tradition of Advaita Vedanta. He travelled all over India to help restore the study of the Vedas. His teachings and tradition form the basis of Smartism and have influenced Sant Mat lineages. He introduced the Pañcāyatana form of worship, the simultaneous worship of five deities – Ganesha, Surya, Vishnu, Shiva and Devi. Shankara explained that all deities were but different forms of the one Brahman, the invisible Supreme Being. Benedict Ashley credits Adi Shankara for unifying two seemingly disparate philosophical doctrines in Hinduism, namely Atman and Brahman. Isaeva states Shankara's influence included reforming Hinduism, founding monasteries, edifying disciples, disputing opponents and engaging in philosophic activity that, in the eyes of Indian tradition, help revive "the orthodox idea of the unity of all beings" and Vedanta thought. Prior to Shankara, views similar to his already existed, but did not occupy a dominant position within the Vedanta. According to Nakamura, it was only after Shankara that "the theologians of the various sects of Hinduism utilized Vedanta philosophy to a greater or lesser degree to form the basis of their doctrines," whereby "its theoretical influence upon the whole of Indian society became final and definitive." Although it is common to find Western scholars and Hindus arguing that Sankaracarya was the most influential and important figure in the history of Hindu intellectual thought, this does not seem to be justified by the historical evidence. According to King and Roodurmun, until the 10th century Shankara was overshadowed by his older contemporary Mandana-Misra, the latter considered to be the major representative of Advaita. Other scholars state that the historical records for this period are unclear, and little reliable information is known about the various contemporaries and disciples of Shankara. For example, Advaita tradition holds that Mandana-Misra is the same person as Suresvara, a name he adopted after he became a disciple of Shankara after a public debate which Shankara won. Some scholars state that Maṇḍana-Miśra and Sureśvara must have been two different scholars, because their scholarship is quite different. Other scholars, on the other hand, state that Mandana-Miśra and Shankara do share views, because both emphasize that Brahman-Atman can not be directly perceived, rather it is discovered and defined through elimination of division (duality) of any kind. The Self-realization (Soul-knowledge), suggest both Mandana Misra and Shankara, can be described cataphatically (positive liberation, freedom through knowledge, jivanmukti moksha) as well as apophatically (removal of ignorance, negation of duality, negation of division between people or souls or spirit-matter). While both share core premises, states Isaeva, they differ in several ways, with Mandana Misra holding Vedic knowledge as an absolute and end in itself, while Shankara holds Vedic knowledge and all religious rites as subsidiary and means to the human longing for "liberation, freedom and moksha". Several scholars suggest that the historical fame and cultural influence of Shankara grew centuries later, particularly during the era of Muslim invasions and consequent devastation of India. Many of Shankara's biographies were created and published in and after 14th century, such as the widely cited Vidyaranya's Śankara-vijaya. Vidyaranya, also known as Madhava, who was the 12th Jagadguru of the Śringeri Śarada Pītham from 1380 to 1386, inspired the re-creation of the Hindu Vijayanagara Empire of South India in response to the devastation caused by the Islamic Delhi Sultanate. He and his brothers, suggest Paul Hacker and other scholars, wrote about Śankara as well as extensive Advaitic commentaries on Vedas and Dharma. Vidyaranya was a minister in Vijayanagara Empire and enjoyed royal support, and his sponsorship and methodical efforts helped establish Shankara as a rallying symbol of values, and helped spread historical and cultural influence of Shankara's Vedanta philosophies. Vidyaranya also helped establish monasteries (mathas) to expand the cultural influence of Shankara. It may be these circumstances, suggest scholars, that grew and credited Adi Shankara for various Hindu festive traditions such as the Kumbh Mela – one of the world's largest periodic religious pilgrimages. Shankara, himself considered to be an incarnation of Shiva,[web 1] established the Dashanami Sampradaya, organizing a section of the Ekadandi monks under an umbrella grouping of ten names. [web 1] Several other Hindu monastic and Ekadandi traditions remained outside the organisation of the Dasanāmis. 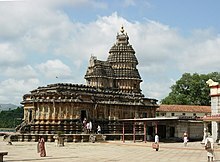 Adi Sankara organised the Hindu monks of these ten sects or names under four Maṭhas (Sanskrit: मठ) (monasteries), with the headquarters at Dvārakā in the West, Jagannatha Puri in the East, Sringeri in the South and Badrikashrama in the North. [web 1] Each math was headed by one of his four main disciples, who each continues the Vedanta Sampradaya. Yet, according to Pandey, these Mathas were not established by Shankara himself, but were originally ashrams established by Vibhāņdaka and his son Ŗșyaśŗnga. Shankara inherited the ashrams at Dvārakā and Sringeri, and shifted the ashram at Śŗngaverapura to Badarikāśrama, and the ashram at Angadeśa to Jagannātha Purī. According to Nakamura, these mathas contributed to the influence of Shankara, which was "due to institutional factors". The mathas which he built exist until today, and preserve the teachings and influence of Shankara, "while the writings of other scholars before him came to be forgotten with the passage of time". Traditionally, Shankara is regarded as the greatest teacher and reformer of the Smarta. In 1977 Jagadguru Aadisankaran, a Malayalam film directed by P. Bhaskaran was released in which Murali Mohan plays the role of Adult Aadi Sankaran and Master Raghu plays childhood. In 1983 a film directed by G.V. Iyer named Adi Shankaracharya was premiered, the first film ever made entirely in Sanskrit language in which all of Adi Shankaracharya's works were compiled. The movie received the Indian National Film Awards for Best Film, Best Screenplay, Best Cinematography and Best Audiography. In 2013, a film Sri Jagadguru Aadi Sankara directed by J.K. Bharavi in Telugu Language was completed and released. ^ Modern scholarship places Shankara in the earlier part of the 8th century CE (c. 700–750). Earlier generations of scholars proposed 788–820 CE. Other proposals are 686–718 CE, 44 BCE, or as early as 509–477 BCE. ^ Swami Vivekananda translates Shivoham, Shivoham as "I am he, I am he". ^ Brahman is not to be confused with the personalised godhead Brahma. ^ Shankara (? ): "(...) Lokayatikas and Bauddhas who assert that the soul does not exist. There are four sects among the followers of Buddha: 1. Madhyamicas who maintain all is void; 2. Yogacharas, who assert except sensation and intelligence all else is void; 3. Sautranticas, who affirm actual existence of external objects no less than of internal sensations; 4. Vaibhashikas, who agree with later (Sautranticas) except that they contend for immediate apprehension of exterior objects through images or forms represented to the intellect." ^ Shcherbatsky: "Shankara accuses them of disregarding all logic and refuses to enter in a controversy with them. The position of Shankara is interesting because, at heart, he is in full agreement with the Madhyamikas, at least in the main lines, since both maintain the reality of the One-without-a-second, and the mirage of the manifold. But Shankara, as an ardent hater of Budhism, could never confess that. He therefore treats the Madhyamika with great contempt [...] on the charge that the Madhyamika denies the possibility of cognizing the Absolute by logical methods (pramana). Vachaspati Mishra in the Bhamati rightly interprets this point as referring to the opinion of the Madhyamikas that logic is incapable to solve the question about what existence or non-existence really are. This opinion Shankara himself, as is well known, shares. He does not accept the authority of logic as a means of cognizing the Absolute, but he deems it a privilege of the Vedantin to fare without logic, since he has Revelation to fall back upon. From all his opponents, he requires strict logical methods." ^ a b c Sharma 1962, p. vi. ^ a b c d Comans 2000, p. 163. ^ Johannes de Kruijf and Ajaya Sahoo (2014), Indian Transnationalism Online: New Perspectives on Diaspora, ISBN 978-1-4724-1913-2, p. 105, Quote: "In other words, according to Adi Shankara's argument, the philosophy of Advaita Vedanta stood over and above all other forms of Hinduism and encapsulated them. This then united Hinduism; (...) Another of Adi Shankara's important undertakings which contributed to the unification of Hinduism was his founding of a number of monastic centers." David Crystal (2004), The Penguin Encyclopedia, Penguin Books, p. 1353, Quote: "[Shankara] is the most famous exponent of Advaita Vedanta school of Hindu philosophy and the source of the main currents of modern Hindu thought." ^ Christophe Jaffrelot (1998), The Hindu Nationalist Movement in India, Columbia University Press, ISBN 978-0-231-10335-0, p. 2, Quote: "The main current of Hinduism – if not the only one – which became formalized in a way that approximates to an ecclesiastical structure was that of Shankara". ^ "How Adi Shankaracharya united a fragmented land with philosophy, poetry and pilgrimage". John C. Plott et al. (2000), Global History of Philosophy: The Axial Age, Volume 1, Motilal Banarsidass, ISBN 978-81-208-0158-5, p. 63, Quote: "The Buddhist schools reject any Ātman concept. As we have already observed, this is the basic and ineradicable distinction between Hinduism and Buddhism". ^ a b c d e f g h Mayeda 2006, pp. 3–5. ^ a b c d e f Isaeva 1993, pp. 69–82. ^ Vidyasankar, S. "The Sankaravijaya literature". Retrieved 23 August 2006. ^ Tapasyananda, Swami (2002). Sankara-Dig-Vijaya. viii. ^ a b Pande 2011, p. 35. ^ The hagiographies of Shankara mirror the pattern of synthesizing facts, fiction and legends as with other ancient and medieval era Indian scholars. Some biographic poems depict Shankara as a reincarnation of deity Shiva, much like other Indian scholars are revered as reincarnation of other deities; for example, Mandana-misra is depicted as an embodiment of deity Brahma, Citsukha of deity Varuna, Anandagiri of Agni, among others. See Isaeva (1993, pp. 69–72). ^ a b Isaeva 1993, pp. 83–87. ^ a b K.A. Nilakantha Sastry, A History of South India, 4th ed., Oxford University Press, Madras, 1976. ^ a b Roshen Dalal (2010). Hinduism: An Alphabetical Guide. Penguin. p. 376. ISBN 978-0-14-341421-6. ^ N.V. Isaeva (1993). Shankara and Indian Philosophy. State University of New York Press. pp. 84–87 with footnotes. ISBN 978-0-7914-1281-7. ^ John Koller (2013). Chad Meister and Paul Copan (ed.). Routledge Companion to Philosophy of Religion. Routledge. doi:10.4324/9780203813010-17 (inactive 27 November 2018). ISBN 978-1-136-69685-5. ^ The dating of 788–820 is accepted in Keay, p. 194. ^ Tapasyananda, Swami (2002). Shankara-Dig-Vijaya. pp. xv–xxiv. ^ Students' Britannica India. Popular Prakashan. 2000. pp. 379–. ISBN 978-0-85229-760-5. ^ Narasingha Prosad Sil (1997). Swami Vivekananda: A Reassessment. Susquehanna University Press. p. 192. ISBN 978-0-945636-97-7. ^ Pande 2011, pp. 75–76. ^ Joël André-Michel Dubois (2014). The Hidden Lives of Brahman: Sankara's Vedanta Through His Upanisad Commentaries, in Light of Contemporary Practice. SUNY Press. ^ Roshen Dalal (2010). The Religions of India: A Concise Guide to Nine Major Faiths. Penguin Books India. ^ a b c Isaeva 1993, pp. 74–75. ^ a b c d e Pande 2011, pp. 31–32, also 6–7, 67–68. ^ Isaeva 1993, pp. 76–77. ^ a b c Pande 2011, pp. 5–36. ^ a b c Isaeva 1993, pp. 82–91. ^ Isaeva 1993, pp. 71–82, 93–94. ^ a b c d e Mayeda 2006, pp. 6–7. ^ Isaeva 1993, pp. 2–3. ^ Kena Upanishad has two commentaries that are attributed to Shankara – Kenopnishad Vakyabhasya and Kenopnishad Padabhasya; scholars contest whether both are authentic, several suggesting that the Vakyabhasya is unlikely to be authentic; see Pande (2011, pp. 107). ^ a b c Isaeva 1993, pp. 93–97. ^ a b c d e f g h Pande 2011, pp. 105–113. ^ a b Pande 2011, pp. 351–352. ^ Pande 2011, pp. 113–115. ^ Mishra, Godavarisha. "A Journey through Vedantic History – Advaita in the Pre-Sankara, Sankara and Post-Sankara Periods" (PDF). Archived from the original (PDF) on 22 June 2006. Retrieved 24 July 2006. ^ Vidyasankar, S. "Sankaracarya". Archived from the original on 16 June 2006. Retrieved 24 July 2006. ^ a b Shah-Kazemi 2006, p. 4. ^ a b Grimes 2004, p. 23. ^ Mayeda 2006, pp. 46–47. ^ Michael Comans 2000, p. 168. ^ Michael Comans 2000, pp. 167–169. ^ Mayeda 2006, pp. 46–53. ^ a b Mayeda 2006, pp. 92–93. ^ Isaeva 1993, pp. 3, 29–30. ^ Swami Vivekananda (2015). The Complete Works of Swami Vivekananda. Manonmani Publishers (Reprint). p. 1786. English Translation 3: Nirvana Shatakam Isha Foundation (2011); Includes translation, transliteration and audio. ^ a b Nakamura 2004, p. 680. ^ Anantanand Rambachan, The limits of scripture: Vivekananda's reinterpretation of the Vedas. University of Hawaii Press, 1994, pp. 124–125: . ^ Isaeva 1993, pp. 57–58. Quote: "Shankara directly identifies this awakened atman with Brahman and the higher knowledge. And Brahman, reminds the Advaitist, is known only from the Upanishadic sayings". ^ Isaeva 1993, pp. 60, 145–154. ^ a b c Fyodor Shcherbatsky (1927). The Conception of Buddhist Nirvana. pp. 44–45. ^ Isaeva 1993, pp. 219–223 with footnote 34. ^ Isaeva 1993, pp. 210–221. ^ S.N. Dasgupta (1997). History of Indian Philosophy, Volume 1. p. 494. ^ a b Michaels 2004, p. 41–43. ^ Ron Geaves (March 2002). "From Totapuri to Maharaji: Reflections on a Lineage (Parampara)". 27th Spalding Symposium on Indian Religions, Oxford. ^ Benedict Ashley, O.P. The Way toward Wisdom. p. 395. ISBN 978-0-268-02028-6. OCLC 609421317. ^ N.V. Isaeva (1992). Shankara and Indian Philosophy. State University of New York Press. p. 2. ISBN 978-0-7914-1281-7. OCLC 24953669. ^ Nakamura 2004, p. 690. ^ Nakamura 2004, p. 691. ^ Nakamura 2004, p. 693. ^ King 2001, p. 128. ^ King 2011, p. 128. ^ Roodurmun 2002, p. 33–34. ^ a b Karl Potter (2008), Encyclopedia of Indian Philosophies: Advaita Vedānta up to Śaṃkara and his pupils, Vol 3, Motilal Banarsidass, ISBN 978-81-208-0310-7, pp. 346–347, 420–423, Quote: "There is little firm historical information about Suresvara; tradition holds Suresvara is same as Mandana Misra". ^ a b Roodurmun 2002, p. 31. ^ Isaeva 1993, pp. 79–80. Quote: "More plausible though was an Advaita conversion of another well known Mimamsaka – Madanamisra; ... Vedantic tradition identifies Mandana Misra as Suresvara". ^ Sharma 1997, p. 290–291. ^ a b c Isaeva 1993, pp. 63–65. ^ Chisholm, Hugh, ed. (1911). "Mādhava Āchārya". Encyclopædia Britannica. ^ Pandey 2000, p. 4–5. ^ Pandey 2000, p. 5. ^ Nakamura 2004, p. 782–783. ^ Nakamura 2004, p. 680–681. ^ Rosen 2006, p. 166. ^ Hiltebeitel 2002, p. 29. ^ "31st National Film Awards". India International Film Festival, iffi.nic.in. Archived from the original on 12 November 2013. ^ "31st National Film Awards (PDF)" (PDF). Directorate of Film Festivals, dff.nic.in. Comans, Michael (2000). "The Method of Early Advaita Vedānta: A Study of Gauḍapāda, Śaṅkara, Sureśvara, and Padmapāda". Delhi: Motilal Banarsidass. Cousins, L.S. (2010). Buddhism. In: "The Penguin Handbook of the World's Living Religions". Penguin. ISBN 978-0-14-195504-9. Doniger, Wendy (1999). Merriam-Webster's Encyclopedia of World Religions. Merriam-Webster. ISBN 978-0-87779-044-0. Fort, Andrew O. (1998). Jivanmukti in Transformation: Embodied Liberation in Advaita and Neo-Vedanta. SUNY Press. Fuller, C.J. (2004). The Camphor Flame: Popular Hinduism and Society in India. Princeton, NJ: Princeton University Press. ISBN 978-0-691-12048-5. Isaeva, Natalia (1993). Shankara and Indian Philosophy. Albany: State University of New York Press (SUNY). ISBN 978-0-7914-1281-7. Some editions spell the author Isayeva. Keshava Menon, Y (1976). The Mind of Adi Shankaracharya. India: Jaico. ISBN 978-81-7224-214-5. King, Richard (2001). Orientalism and Religion: Post-Colonial Theory, India and "The Mystic East". Taylor & Francis e-Library. Larson, Gerald James (2009). Hinduism. In: "World Religions in America: An Introduction". Westminster John Knox Press. ISBN 978-1-61164-047-2. Mayeda, Sengaku (2006). A thousand teachings : the Upadeśasāhasrī of Śaṅkara. Motilal Banarsidass. ISBN 978-81-208-2771-4. Minor, Rober Neil (1987). Radhakrishnan: A Religious Biography. SUNY Press. Morris, Brian (2006). Religion and Anthropology: A Critical Introduction. Cambridge University Press. Mudgal, S.G. (1975). Advaita of Shankara: A Reappraisal. New Delhi: Motilal Banarasidass. Nakamura, Hajime (2004). "A History of Early Vedanta Philosophy. Part Two". Delhi: Motilal Banarsidass Publishers Private Limited (Reprint of orig: 1950, Shoki No Vedanta Tetsugaku, Iwanami Shoten, Tokyo). Narayana Sastry, T.S (1916). The Age of Sankara. Pande, G.C. (2011). Life and Thought of Śaṅkarācārya. Motilal Banarsidass. ISBN 978-81-208-1104-1. Pandey, S.L. (2000). "Pre-Sankara Advaita. In: Chattopadhyana (gen.ed. ), "History of Science, Philosophy and Culture in Indian Civilization. Volume II Part 2: Advaita Vedanta"". Delhi: Centre for Studies in Civilizations. Popular Prakashan (2000). Students' Britannica India, Volumes 1–5. Popular Prakashan. ISBN 978-0-85229-760-5. Pradhavananda; Isherwood, Christopher (1978). Shankara's Crest-Jewel of Discrimination. USA: Vedanta Press. ISBN 978-0-87481-038-7. Roodurmun, Pulasth Soobah (2002). Bhāmatī and Vivaraṇa Schools of Advaita Vedānta: A Critical Approach. Delhi: Motilal Banarsidass Publishers Private Limited. Scheepers, Alfred (2000). De Wortels van het Indiase Denken. Olive Press. Shah-Kazemi, Reza (2006). "Paths to Transcendence: According to Shankara, Ibn Arabi & Meister Eckhart". World Wisdom. Sharma, Chandradhar (1962). Indian Philosophy: A Critical Survey. New York: Barnes & Noble. Sharma, C. (1997). A Critical Survey of Indian Philosophy. Motilal Banarsidass. ISBN 978-81-208-0365-7. Sharma, B.N. Krishnamurti (2000). History of the Dvaita School of Vedānta and Its Literature: From the Earliest Beginnings to Our Own Times. Motilal Banarsidass Publishers. ISBN 978-81-208-1575-9. Shetty, V.T. Rajshekar (2002). "Caste, a nation within the nation: recipe for a bloodless revolution". Books for Change. Singh, N.; Barauh, B. (2004). "Encyclopaedic Dictionary of Pali Literature, Volume 1". Global Vision. Tapasyananda (2002). Sankara-Dig-Vijaya: The Traditional Life of Sri Sankaracharya by Madhava-Vidyaranya. India: Sri Ramakrishna Math. ISBN 978-81-7120-434-2. Ingalls, Daniel H.H. (1954). "Śaṁkara's Arguments against the Buddhists". Philosophy East and West. 3 (4): 291–306. doi:10.2307/1397287. JSTOR 1397287. Mishra, Parameshwar Nath (2003), "Era of Adi Shankaracharya 507 B.C.–475 B.C. ", Howrah Samskriti Rakshak Parishad, West Bengal. Mishra, Parameshwar Nath, "Amit Kalrekha", 3 vols. (in Hindi), Howrah Samskriti Rakshak Parishad, West Bengal. Reigle, David (2001). "The Original Sankaracarya" (PDF). Fohat. 5 (3): 57–60, 70–71. Navone, J.J. (1956). "Sankara and the Vedic Tradition". Philosophy and Phenomenological Research. 17 (2): 248. doi:10.2307/2104222. JSTOR 2104222. Biderman, Shlomo (1978). "Śankara and the Buddhists". Journal of Indian Philosophy. 6 (4). doi:10.1007/BF00218430. Rukmani, T.S. (2003). "Dr. Richard de Smet and Sankara's Advaita". Journal of Hindu-Christian Studies. 16. doi:10.7825/2164-6279.1295. Wikimedia Commons has media related to Adi Shankara.